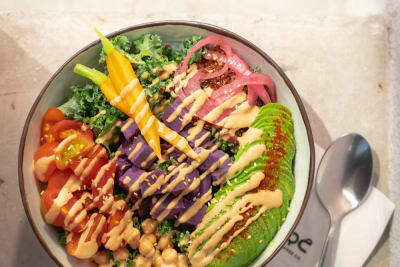 When US President Donald Trump and North Korean leader Kim Jong-un met for their two-day summit at the Sofitel Legend Metropole Hanoi in late February of this year in Vietnam, the White House asked for this special dessert to be included on the menu. More than just the favourite dessert of the president, this sweet ending had a deeper significance that’s clear from its moniker: Chocolate Freedom (pictured above). It is a signature dish at the White House, and Chocolate Freedom, which is now always available at Angelina restaurant within the hotel, is a hot, runny-centred chocolate cake served with chocolate crumble, fresh berries and vanilla ice cream. Bees represent an important part of our ecosystem, and they’re dwindling in record numbers that further represent a need for a unified global fix to many of our environmental issues. As a tribute to its locale, the aptly named Honey Bee at Grand Hyatt Taipei is made with high-quality Taiwanese longan honey. 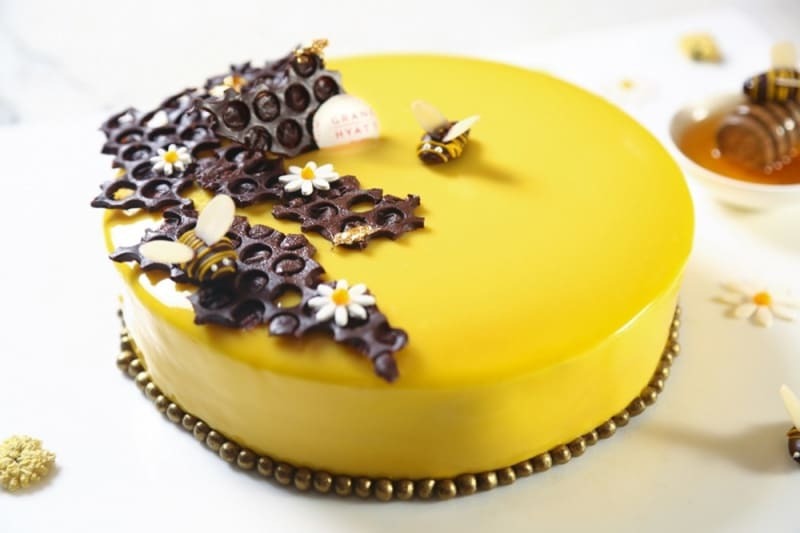 All the sweetness comes from the honey itself, while the cake consists of a blend of honey mousse, chocolate cream, honey sponge cake and a Speculoos biscuit base. As if there wasn’t enough of the golden nectar already, the whole cake is finished with a honey glaze. 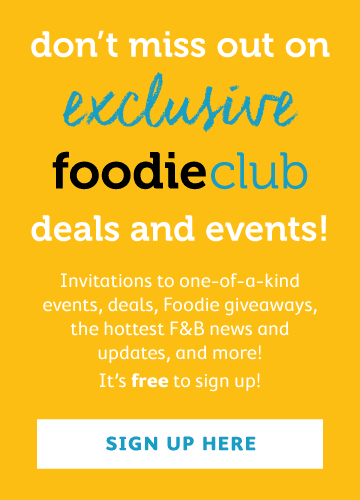 There’s nothing like a chocolate-gilded cage to prove a point. 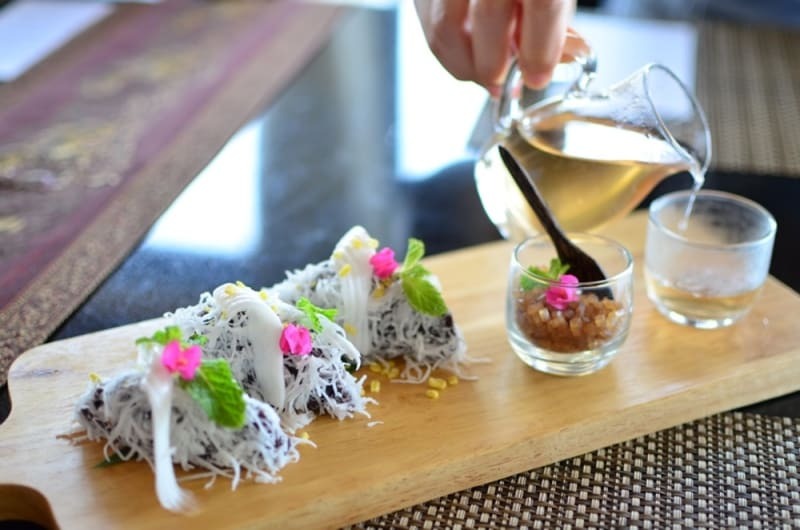 This hotel’s signature dessert is inspired by the bird-rearing culture of central Vietnam. 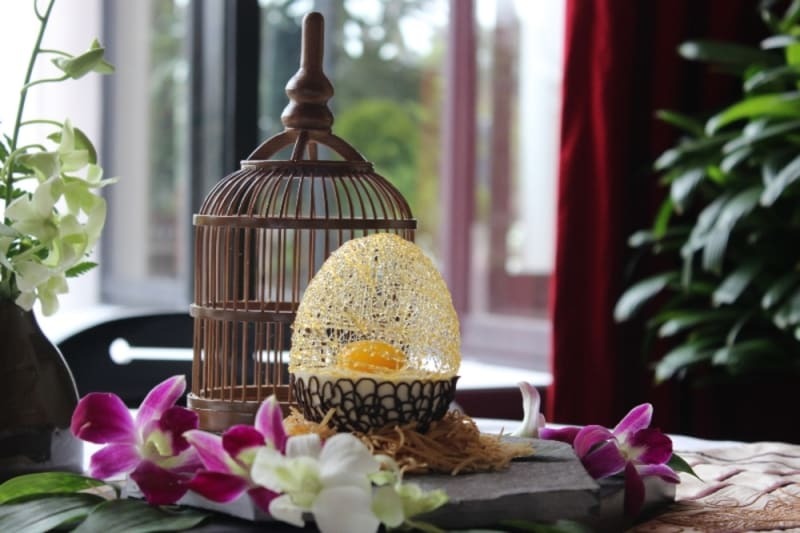 La Residence created the Sweet Eggnest, featuring a chocolate and caramel egg, a mousse-stuffed coconut, a raspberry heart, passion fruit spheres and a crisp apple nest. Breaking through the exterior shell to reach the softer interior sounds like one metaphor we’d like sugar-coated. This dessert from The Anam is anything but typical. True to its name with a sticky texture symbolic of family cohesiveness, the centre of each of the dessert’s two cakes is a concoction of soaked mung bean, sugar, salt, sticky rice flour and coconut milk blended into a smooth paste and shaped into spherules before being cooked in oil laden with sliced shallots. 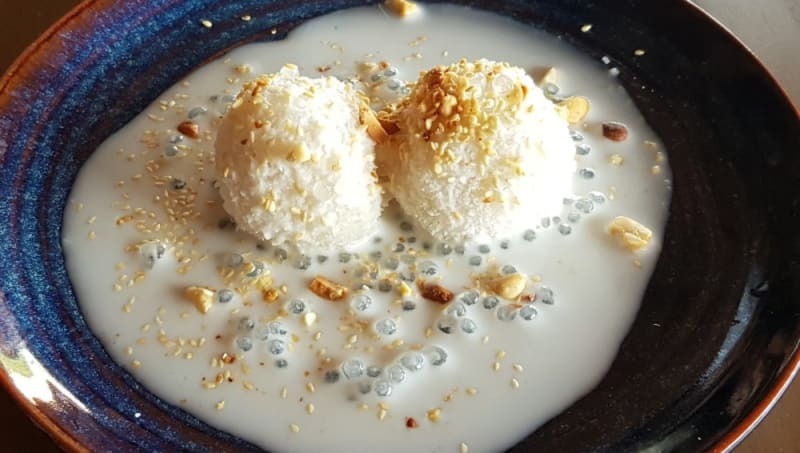 The cakes are then completely covered by a layer of sticky rice flour dough and boiled, cooled, rolled in desiccated coconut and drizzled with coconut sauce, sesame seeds and peanuts. Use this sumptuous dessert to get yourself out of a sticky situation. 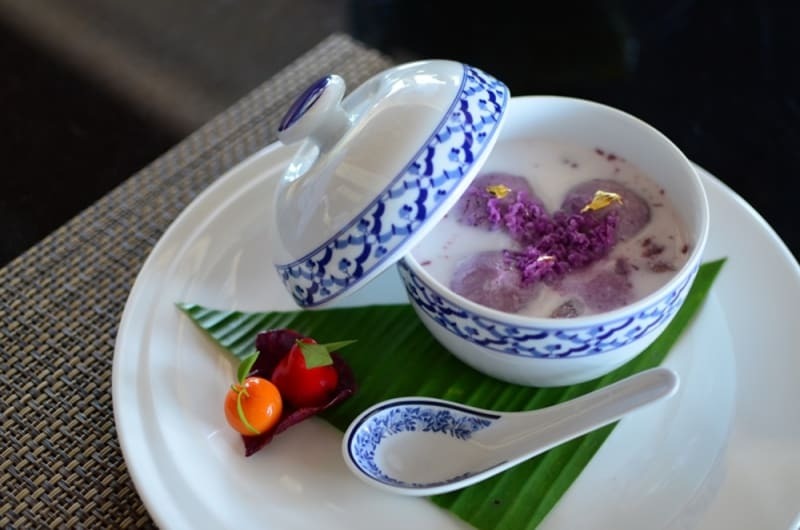 Those with a taste for all things Thai know that super-sweet jelly in coconut milk is exactly what you need in the wake of a spicy meal. At Banyan Tree’s hilltop restaurant Saffron, Chef Rainer has tinkered and toyed with a few traditional recipes to come up with two signature sweets: thaow paeb nahm khing, a lip-smacking concoction of mung bean puff, young coconut and hot ginger tea, and pra krim pheuk, a light serving of taro dumplings in coconut milk, served with purple potato ice cream. When things get heated at the bargaining table, a Thai coconut concoction could cool everybody right down. 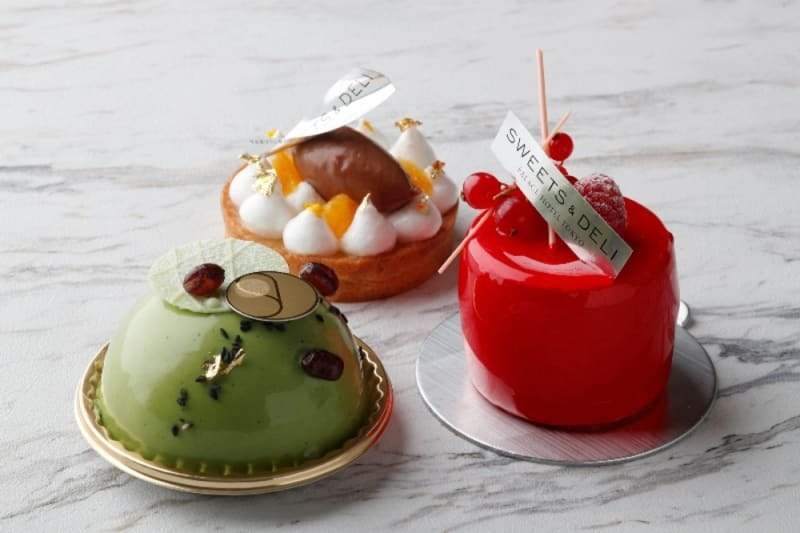 These desserts at Palace Hotel Tokyo were designed to celebrate spring, but how about also turning over a new leaf? 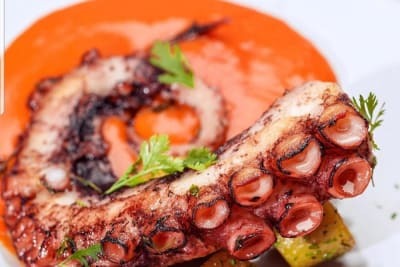 They include a yomogi (mugwort) mousse with black sesame and red bean paste cream and Bavarian cream filling, a kiyomi (a Japanese citrus hybrid) tart with orange-flavoured chocolate cream and meringue and a raspberry mousse and redcurrant jelly with rhubarb sponge cake. Spring marks a time of rebirth and change, exactly what is needed during diplomatic negotiations. So the next time you find yourself in the midst of a political stalemate, tasked with tricky cross-border negotiations or are trying to avoid a nuclear war, perhaps pudding holds the key to both a swift resolution and a sweet conclusion.